T.S. Elliot’s criticism, whether in his Essays on Elizabethan Drama or To Criticism the Critic or in selections made by Frank Kermode or John Hayward: no one gives the same severe yet diffident impression as Eliot, unfailingly pulling from his sleeve a startling, indeed impudent, new slant. If Edmund Wilson’s bulk of reviews and articles had to be reduced to one exemplary volume, I would pick Axel’s Castle, in which the still-youthful critic tackles, with his customary clarity of exposition and firmness of opinion, the central texts of a modernism that, as of 1931, still baffled and infuriated many of his learned contemporaries. And, if you want a sixth, Criticism: the Major Texts, edited by Walter Jackson Bate: a double-column compendium of all the usual suspects from Aristotle on, prepared by Professor Bate as a textbook but useful even to post-graduates. 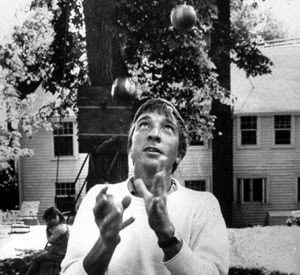 John Updike was born in 1932 in Shillington, Pennsylvania. He graduated from Harvard College in 1954 and spent a year in Oxford, England at the Ruskin School of Drawing and Fine Art. From 1955 to 1957 he was a member of the staff of the New Yorker, and since 1957 has lived in Massachusetts. He is the father of four children and the author of more than fifty books, including collections of short stories, poems, essays, and criticism. His novels have won the Pulitzer Prize (twice), the National Book Award, the National Book Critics Circle Award, the Rosenthal Award, and the Howells Medal. A previous collection of essays, Hugging the Shore, received the 1983 National Book Critics Circle Award for criticism. "Critical Library: John Updike" was posted October 03, 2009.